Good afternoon. Can you help me please, I'm looking for a drum toner cartridge for a Konica Minolta 190F Bizhub printer. Are you able to supply it and at what cost? Regards, Trevor. The Bizhub 190F laser printer uses a separate toner and drum cartridge so you need to establish which part needs replacing. 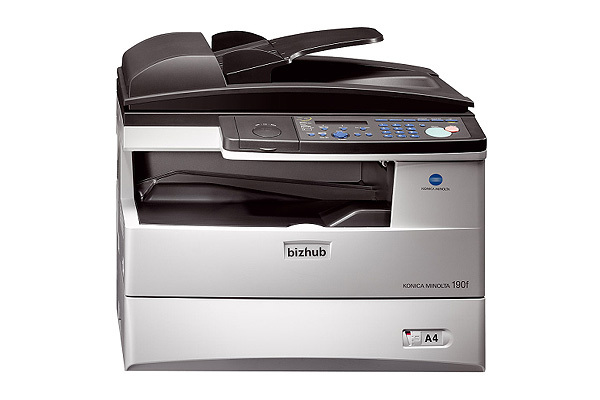 We only currently stock the genuine Konica Minolta TN-109 toner cartrudge for the Bizhub 190F. The genuine Konica Minolta DR-109 drum cartridge for this printer has been discontinued and we're no longer able to supply this item. Therefore, if you require a new drum for your Bizhub 190F printer, we advise you to contact Konica Minolta directly to enquire about the availability of this product. The sleek and compact Konica Minolta Bizhub 190F is perfect for offices with limited spaces. This multifunction device can copy, scan, fax, and print. It offers super G3 fax and a laser printer with a maximum resolution of 600 x 600 dpi. The Konica Minolta Bizhub 190F laser printer has a standard RAM capacity of 8 MB and maximum 40 MB. This unit can print and copy up to 7,500 pages per month. Networking connectivity is not standard to the Bizhub 190F multifunctional system. The Konica Minolta Bizhub 190F mono laser printer measures 520 x 460 x 461 mm and weighs 21.1 kg. The Bizhub 190F comes in black and grey and features an organised control panel with LCD display, function buttons, and numeric keypad. For connectivity, a USB port is available. The Konica Minolta Bizhub 190F black and white copier has a print speed of 19 ppm. This compact unit has a small footprint yet it can do four functions. It delivers good quality output from prints and scans to copies and faxes. The Konica Minolta 190F multifunction printer is very easy to use and setup. The Konica 190F printer can help save time and resources as it comes with built-in automatic document feeder and automatic duplexer. Impressively sharp text and fine lines can be printed thanks to the Bizhub 190F's polymerised toner. This multifunction printer is not compatible with Macintosh operating systems. Networking such as Ethernet must be bought separately. The Konica Bizhub 190F office printer is ideal for small workplaces but may not be able to handle the needs of demanding environments.